On a sandy cove of its own, at Breezes "beach" and "lounge" make an indulgent match. 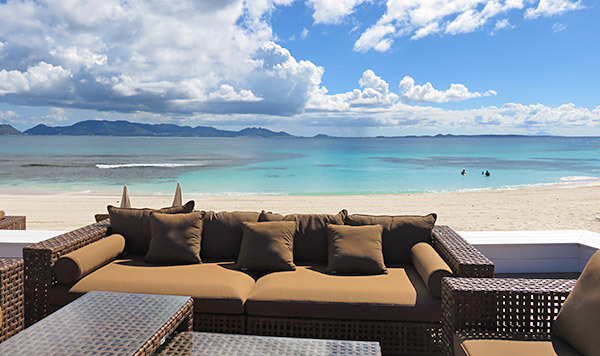 One of Anguilla's most popular spots, this is the island's go-to beach lounge. 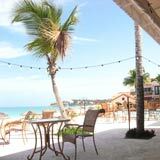 The resort's beachfront restaurant, Breezes is just one step up from this secret beach. Accessible only by boat or if you are a hotel or restaurant guest, Merrywing Bay breathes a distinctly peaceful and private air. This is true beachfront dining of an exclusive kind. The restaurant itself can be described in two words: comfortably luxurious. Oversized and spacious, take a seat. Relax. Stretch out. No space has been spared for dining, dancing and lounging. The terrace's lower level is made up of wicker couches so large they could double as day beds. Plush, you sink right in. With the beach just one step down, the front row is the most coveted seat in the house. 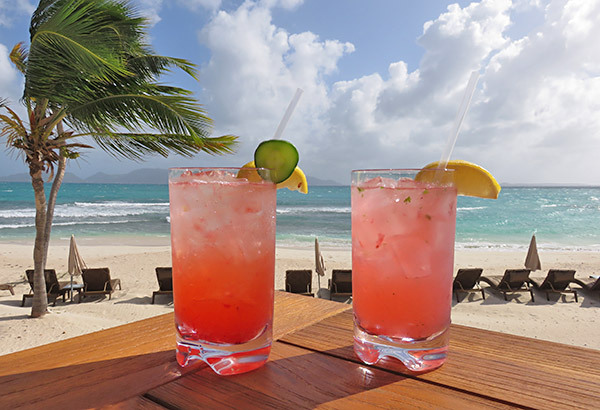 A "sip, swim, sip, swim, eat, repeat" routine is within easy reach. 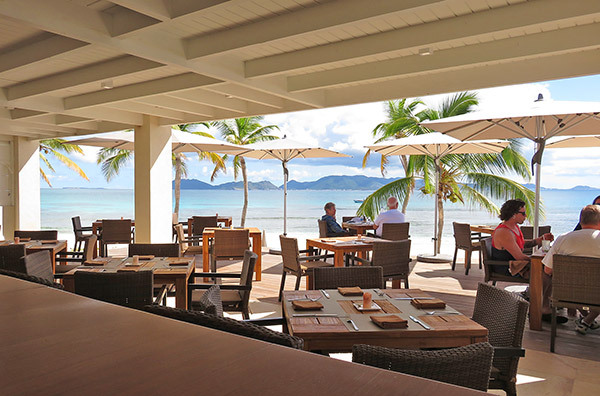 No matter the seat you choose, every corner of the restaurant boasts an HD vivid view of Caribbean blue and St. Martin's mountainous landscape. 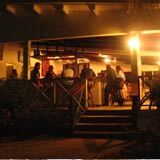 The addictively comfortable couch seating is one level down from the restaurant's main dining area and bar. 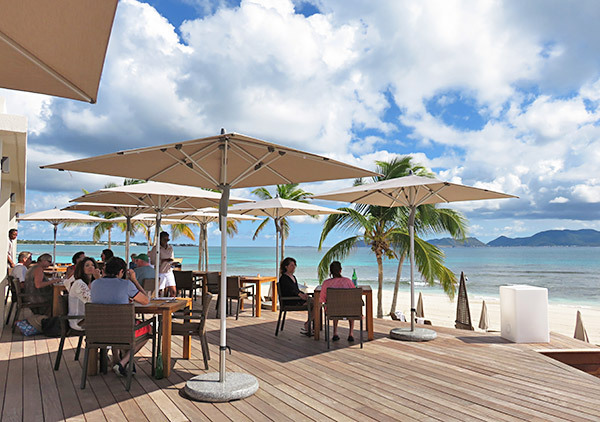 They, too, claim an awe-inspiring view of St. Martin. Crisp white umbrellas, white walls and modern beach furniture are offset by warm wood underfoot, wood tables and stonework in the bar. 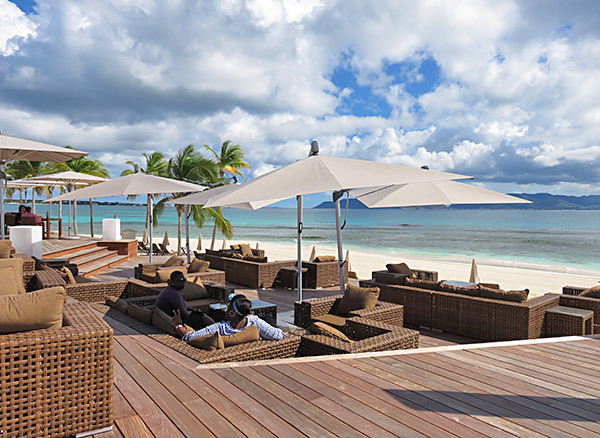 With an Anguilla beach backdrop, European-chic meets Caribbean-cool at Breezes. Happy patrons take to the dance floor. The music pulses on Saturday afternoons. 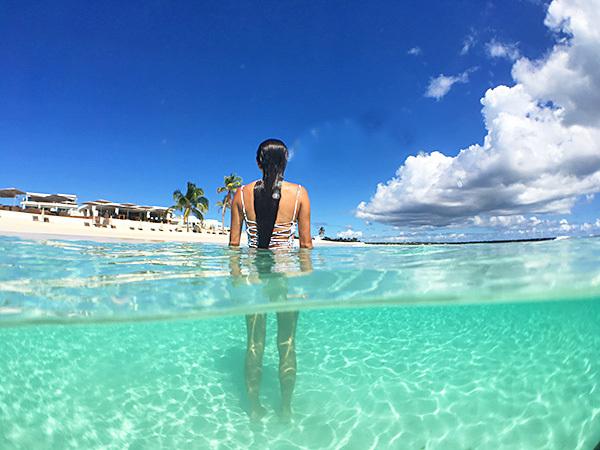 The Caribbean Sea shimmers. Tradewinds blow in, cooling your body. The sun warms you back up as you drift into total relaxation mode. This is "beach lounging" at its finest. ... and a number of syrupy cocktails whipped up with ingredients straight from CuisinArt's gardens. Pairing perfectly with a crisp cocktail are Breezes' appetizers. A selection of gourmet Spanish and Asian inspired plates to share, they include shrimp spring rolls, beef empanadas, lobster corn arepas and a particularly vibrant poke platter. This plate has tons of variety and color! 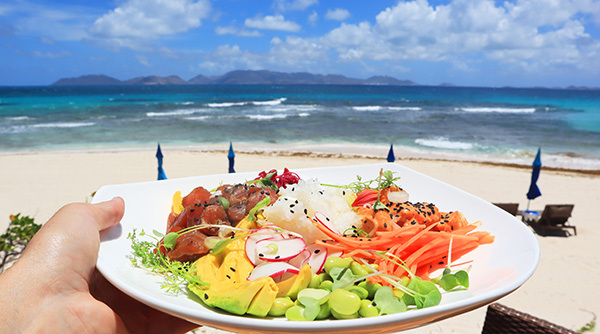 Fresh chunks of sesame and soy bathed tuna, spicy salmon, a generous helping of sushi rice, mango, beans, avocado and thin slices of beet all make appearances on the plate. The blend of flavors? Light and bright, like an Anguilla day. Presiding over the kitchens at The Reef, you won't find a chef more passionate than Chef Manuel Gonzalez. Fueled by a passion for creating modern, Spanish-inspired cuisine, Chef Manuel bubbles with excitement. Sizable chunks of fish are bathed in lime juice and served side by side with sweet potato. The dish is finished with crispy corn maize and fried plantain. Ceviche is always refreshing and Chef's is expertly prepared. Next on the menu are a number of artisan pizzas baked in a 900° wood oven. Margarita with pecorino, pepperoni with spicy honey, shrimp and zucchini. 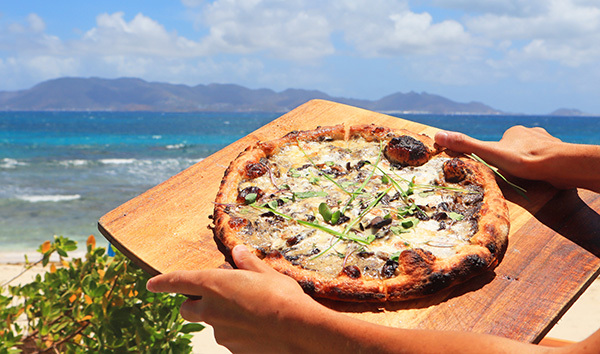 Rich combinations of complementary flavors, the porcini mushroom with white sauce is at the top of our "favorite Anguilla pizzas" list. Pizza dough is lathered with garlic sauce and a savory mushroom blend. It is sprinkled with porcini mushrooms, fontina cheese and mozzarella. Then? It is set to bake in the restaurant's 900° wood oven. The oven cooks this pizza to absolute perfection, creating an almost "fried" texture to its top. The extra-extra-special touch is the black truffle oil, misted on after baking. This pizza has won a pizza my heart! 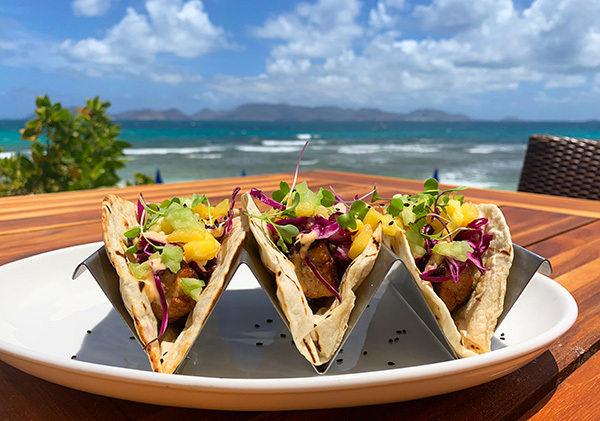 Fresh mahi mahi is succulent and sumptuous, layered with fresh pineapple and cucumber and served in a grilled corn shell. The lime-sriracha sauce brings a spicy bite to these tropical tacos. 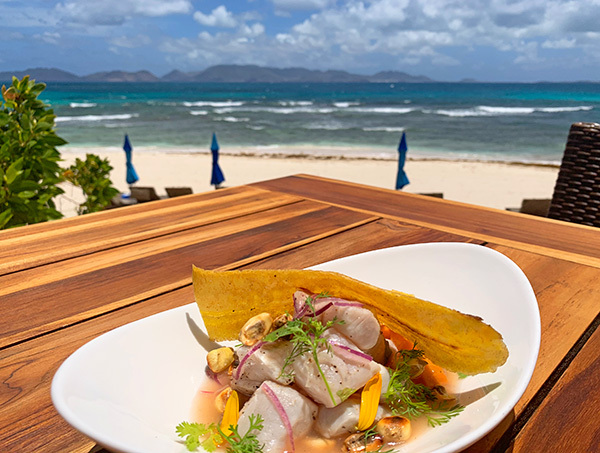 Larger entrées include the grilled chipotle-lime chicken, flank steak with chimichurri hoisin BBQ sauce and a Chef Lester Gumbs special, the red snapper with tostones. 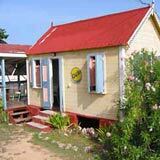 Chef Lester Gumbs is Breezes' sous chef and one of Anguilla's most talented chefs. Chef cooks his snapper so it melts in your mouth! 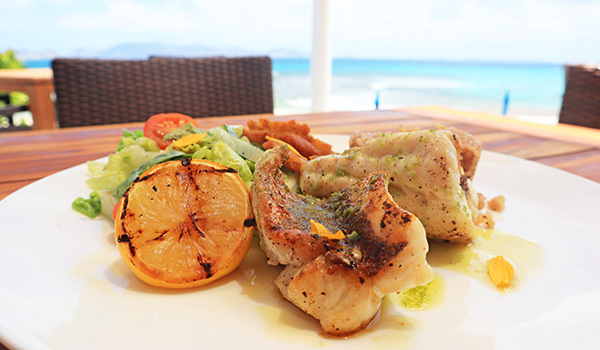 Incredibly flaky, Chef's snapper is gently drizzled with parsley oil. The fish is served with coconut rice, salad and a most excellent touch - tostones. Crisp and thin, top these fried delights with a piece of snapper for a taste explosion. Saving my personal favorite for last, Breezes boasts a number of decadent desserts. 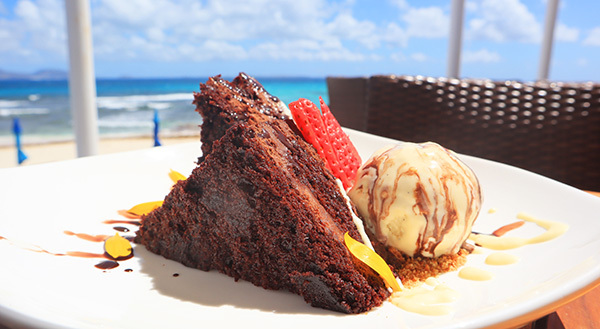 The chocolate layer cake is one of the best I have found yet in Anguilla. This is a serious serving of chocolate cake! A sizable square of layered cake is sliced in two and served with vanilla bean ice cream. The entire plate is drizzled with a chocolate malt sauce and garnished with strawberries and sunflower petals. It is as good as it looks! 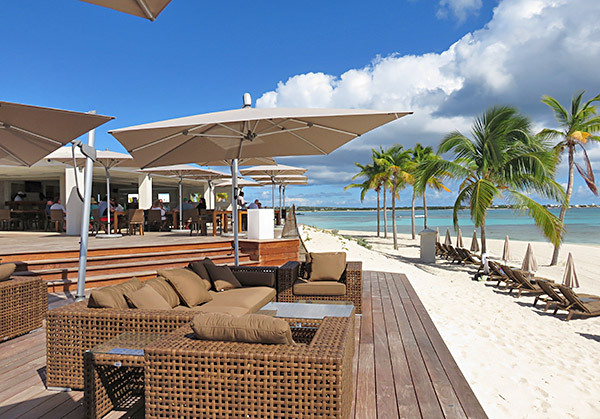 On an island known for "beach lounging" The Reef's beach lounge is a winning concept. 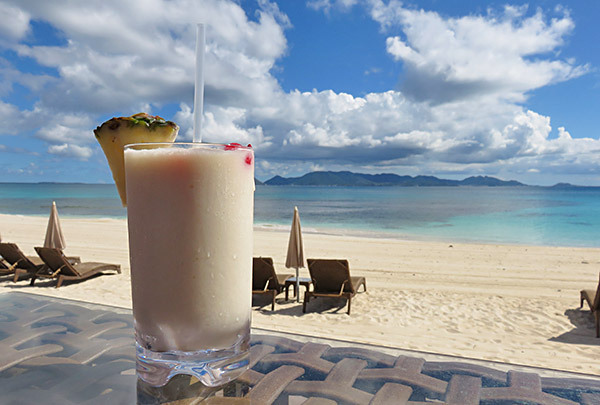 Add a menu that rivals any of Anguilla's long-established top beach restaurants and you have a "must do" beach experience. Breezes hits every high note. Directions: Located inside The Reef. 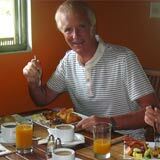 Drive to CuisinArt's golf course and continue on that road past the golf course club house until you reach The Reef. Once you arrive at The Reef, park in the parking lot to the left of the hotel (on the east side). Follow the path around the hotel, past the pool and down to the beach where Breezes is located. Hours: Lunch daily, dinner Sunday's only.